Sprung steel and rubber bumpers for vintage cars. Homepage. This page: For the automobilist who preferred to park by touch, sprung rubber and steel bumpers. The Connolly rubber motor-car bumpers. In the late 1920's, compulsory driving tests were still several years away, and the overall standard of driving was, if contemporary films and magazine articles are anything to go by, pretty poor. Lane discipline, caution when attempting to overtake other road users (including horses), and negotiating confined parking bays, were just some of the problem areas that the vintage automobilist had to deal with. Parking, as now, was a real problem for some, and not all cars in the 1920's were fitted with bumper bars as standard. The J.W. & T. Connolly Ltd firm came up with a solution for those to whom parking accurately, without crumping a front wing or a rear-mounted spare wheel, was an issue. Their patent Connolly Rubber Bumper was the solution to the problem. 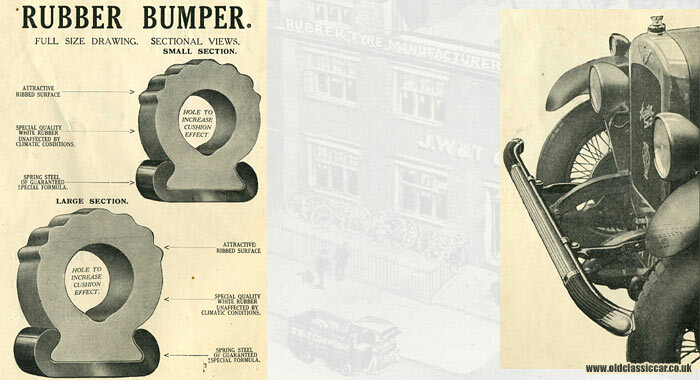 The firm already produced a huge variety of rubber products - tyres, bump stops, draught excluders, solid band tyres and so on - and could also supply non-rubber motoring accessories such as number plate (pressed and cast), running board steps and cast iron wheels. Therefore they knew their market well, and identified a need for aftermarket bumper assemblies to suit all the popular cars of the day. There were three basic models - WBR (White and Black Rubber), BR (Black Rubber) and WR (White Rubber). Mounting brackets, or dumbirons, could be supplied to suit all makes of car, although they prudently added: "No liability will be accepted by us for accidents to vehicles, property or individuals in respect of vehicles fitted with Connolly Rubber Bumper." The rear cover of their catalogue features a smart late-vintage motor-car, fitted with a double front (WBR) bumper. Does anyone recognise the model of car shown? The registration YF 3642 dates to mid-1927. A second photograph shows a rear corner bumper setup on a different car (note the solid wheels), a car fitted with a "Four wheel brakes" cast aluminium warning sign (another accessory that Connolly could supply, for 1s 9d). A third illustration shows a single front bumper - again the WBR type - fitted to a vintage Austin Six. Bumpers were available in both large and small sections, depending on the car it was to be fitted to. A large-section single bumper would have cost the owner £3 15s 0d, or £3 3s 0d for the smaller version, to which a further fitting charge of 10s would be applied. Do any of these bumper conversions from the 1920's still survive?